The HEATKILLER® Tube Series is a modular series of high end reservoirs with a glass tube made from borosilicate glass. It has some outstanding features which are listed here. Thanks to a large filling mouth and a bayonet catch lid the HEATKILLER® Tube Series reservoirs can be opened without any tools and is easy to fill. It has never been easier to re-fill a cooling medium. Borosilicate is a glass with very high chemical and thermic resistance. It is scratch-resistant and has very low heat expansion. 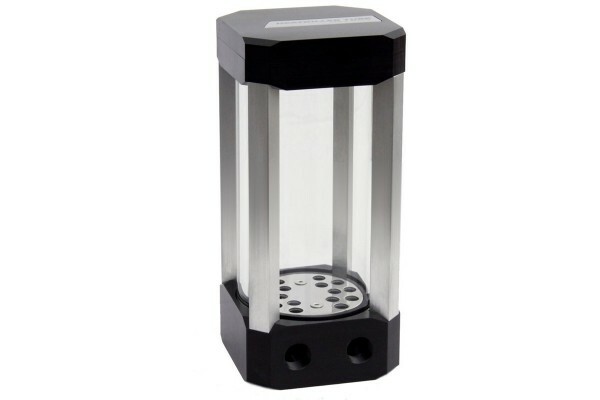 These outstanding features make borosilicate an ideal material for reservoirs. To account for different space availability in current cases, the HEATKILLER® Tube Series reservoir glass tubes are available in sizes 100mm, 150mm and 200mm. Besides a standalone version, there are versions with direct connections for pumps. They support D5 and DDC pumps by Lowara (formerly known as Laing) and their derivatives. In designing the HEATKILLER® Tube Series, we took great care not to waste any of the available volume. That makes the HEATKILLER® Tube Series reservoirs very low maintenance, because they need fewer re-fills. The exclusively developed anti-cyclone-inlay which is located at the bottom of the reservoir prevents vortices that easily form in reservoirs. This reduces noise levels and makes air bleeding easier. The pump adapter for D5 and DDC pumps comes with a streaming optimized pump chamber. This causes fewer vortices during use, which has a positive effect on both flow rate and air bleeding. The HEATKILLER@ Tube Series reservoirs are completely produced in Germany. For optimal integration into a water cooled system we offer different mounting systems to fit your build. Two different height pedestals are available for mounting the HEATKILLER@ Tube Series reservoir to the case floor or free-standing. A multifunctional bracket mount offers options for vertical montage. Several adapters are available. Some can be used to attach the reservoir to 120x120mm or 140x140mm cooler slots. Others allow for a montage of the reservoir on a radiator from the MO-RA3 series. HEATKILLER@ Tube Series reservoirs can be set in scene with LED illumination. We offer splash-safe LED strips in various colors. The strips are hidden in the struts of the reservoir cage. To customize your HEATKILLER@ Tube Series you can exchange the default struts. We offer aluminum struts in natural color or with a choice of anodized colors. Sind die Streben bei diesem AGB dieselben, die als 'raw aluminum' (Art. Nr 1013417) verkauft werden? Ja, es handelt sich bei der Artikel Nr. 1013417 um Austauschstreben, daher für die Heatkiller Tubes individuell einsetzbar.